Perfectly situated up a quiet private drive overlooking Raglan Harbour to the North and the Inner Harbour to the East, this comfortable 3-bedroomed family home is only a few minutes walk from the centre of Raglan and the town Beach, and a five minute drive from the surfing beaches. There are spectacular harbour views from living areas, main bedroom and deck. The spacious open-plan lounge has two sets of French doors opening onto a wrap-around deck with a large table and benches for outside dining. The lawned garden area all around the house makes it especially suitable for young families. The house sleeps a maximum of 7 people. The master bedroom with harbour view has a queen bed; the second bedroom has a double and a single bed, and the third bedroom has a single and a small single bed. There is a well-equipped family kitchen, and a newly-fitted bathroom with shower. Washing-machine. BBQ available. Free wireless broadband access, BluRay DVD, TV with Freeview, SKY satellite dish but bring your own SKY receiver/decoder box (HDMI) if you want to watch what you have at home . Heat pump to living area plus two oil-filled electric radiators available for winter heating. NOTE: This is great value accommodation for central Raglan, ideal for families or groups. We have another smaller property just next door (Kent Homestay) and can accommodate groups of up to 11 across both properties. Standard rates are $140.00 per night for 2 + $25 each extra person. Off-peak winter rates are $130 for 2. Peak summer and holiday rates are $200 per night for 4. Minimum 4 night/4 person bookings over the peak holiday period from mid-December to early February. 1 night bookings available by ENQUIRY only - last-minute, off-peak, or where a single night is left unbooked between other bookings. Cleaning and linen surcharge may apply for single-night bookings. Well-equipped family kitchen with electric oven, microwave and fridge/freezer. Panoramic views over Raglan Harbour. French doors open onto wrap-around deck. Large dining-table with benches. BBQ. Garden chairs and umbrella. Safety barrier for entrance on request..
Rick's house has everything you need for a relaxed weekend or holiday. 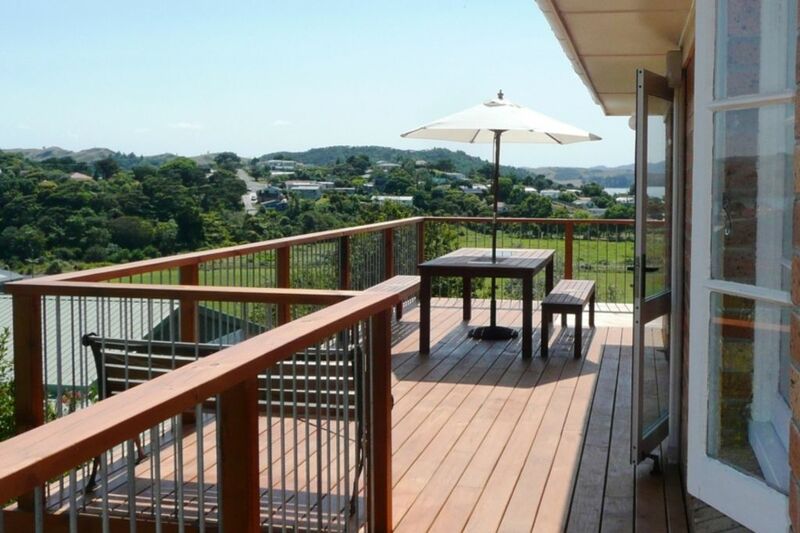 The deck with wide views of Raglan is great. Short stroll to town and water front with cafes and shops. Spotlessly clean and tidy, plenty towels, kitchen well equipped. Highly recommend this bach. This house was clean and tidy with a lovely view of the distant harbour and was an easy walk to town. It had a nice sitting area outside on the deck and was fully equipped with everything we needed. Clean and comfortable. Exactly what we wanted for a family weekend away. Great view, the kitchen was setup very well with everything you would could want for a longer stay. We only stayed 2 nights but I can see that having 5 to 6 people staying there for a week, you would not feel like you are on top of each other, there is plenty of room. Easy walk to the waterfront and into town. This property is conveniently located, it has great views. It was clean and tidy. The owner responded quickly to all queries. The property is clean and tidy and is well equipped. It has lovely views over the water. The decor is rather retro, but ok. The small bedroom smelt musty, and the small single bed is only suitable for a preschooler ( the size was mentioned in property details). We would happily stay at this place again and recommend to others. Great spot, lovely spot with everything we needed. Would recommend to anyone wanting to stay in Raglan.